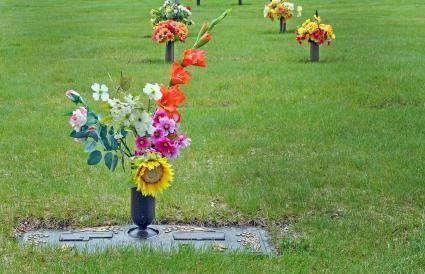 A cemetery flower vase can be a nice addition to your loved one's gravesite. It can also be a beautiful enhancement to the look of an existing memorial. There are many styles, colors, designs, and materials available to choose from, it is up to you to decide which would be the most perfect and appropriate for your loved one. These vases are beautifully and carefully crafted. They typically have a polished finish and are available in a variety of shapes, colors, and sizes. Some common shapes include the classic urn, a modern upright rectangle, a heart-shaped vase, and a cross-shaped vase. The granite and marble vases are made from highly durable natural materials and withstand the roughest weather. It is also easy to maintain and will look new for a very long time. The vase is typically placed to the side of an upright headstone so it does not block the inscription. 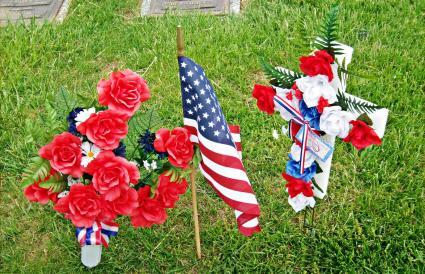 Often they are bought in pairs and placed on each side of the headstone so they are aesthetically symmetrical. These vases can also be built into the headstone. When you do bring flowers, as a general rule of thumb, start with a bouquet but it really depends on the size of the vase or vases. You will be able to judge just how many flowers are needed for the vase after your initial visit. The prices vary for these vases and can be purchased at Memorials.com. The bronze vases are beautiful and durable. They will endure the inclement weather but may develop a patina over time due to oxidation which actually gives the vase an antique, timeless look. The vases are typically a gold to brown color and personalized engraving is also an option. It is mounted on the headstone or an in-ground version is available. This is when the vase is inserted into a canister (installed underground) so it is hidden when not in use. These bronze vases can be purchased at ThompsonMonuments.com. Vases made from cast metal are quite beautiful and less expensive than other types of vases. They are constructed from aluminum and have a durable powder coating. They are most often styled after traditional granite vases. You can get the granite look without the granite price. They are moderately durable and will need replacing every few years. The metal vases can be purchased at USMetalCraft.com. The in-ground vases come in a variety of styles, colors, and designs. The designs can range from simple and timeless to traditional, contemporary elegance. The vase is installed at the headstone and can be inverted and stored away in an underground canister when it is not being used. The in-ground vases can be purchased at EverlifeMemorials.com. This cemetery flower holder is very nice, and perfect for those looking for an inexpensive, simple option. It is made of a durable plastic and includes a plastic or metal spike. You can find a more basic vase or one with a high-quality look, it just depends on what you're looking for. It comes in a variety of colors including white, green, gold, silver and even a granite-look. There is no installation or canister required for this vase. You simply screw in the spike and insert the vase into the ground. The spiked vases can be purchased at CemeteryVase.com. 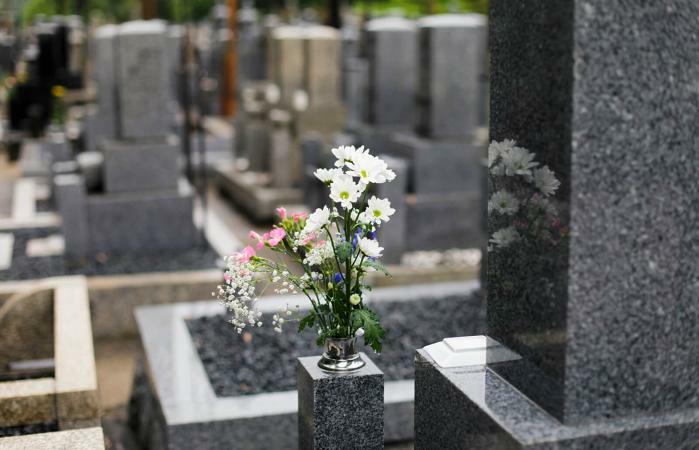 Much thought goes into choosing a headstone for your loved one. You want the symbolism of the headstone to show how much the person is loved and missed. Adding flowers to the site will not only add a pop of color but it will also add to this symbolism and show that this person is special and remembered. The headstone and cemetery flower vase you place at the site will give your loved one a final resting place of peace and beauty.